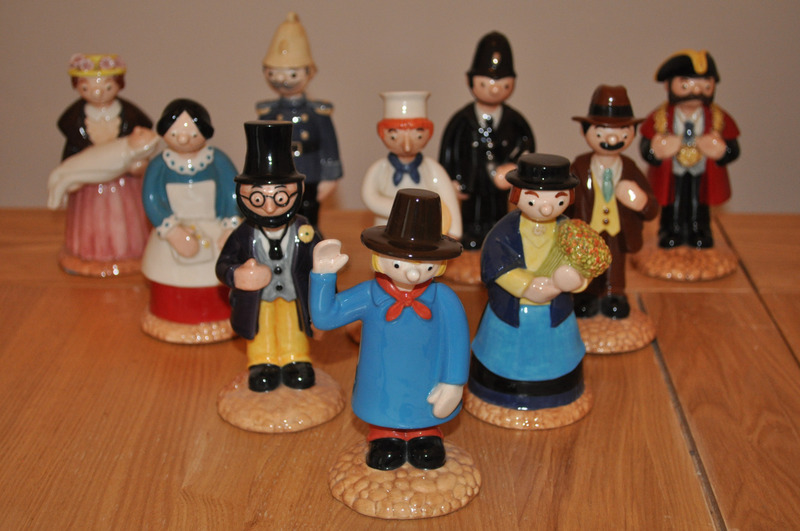 About: This is the complete set of Trumpton / Camberwick Green characters, made as part of the John Beswick collection for Royal Doulton. Each character is hand made, hand decorated and issued in a limited edition of 2500. Some are more easy to come by than others, the reasons for which are not entirely clear, although I understand a fire in the factory is the most likely explanation. I think it is pretty unusual to see them all together, hence why they deserve a spot in the museum. As a huge fan of 1960’s / 70’s / 80’s children’s TV, I was given my first character as a present some time ago and build up the collection over a number of years. Mrs Cobbett (holding the flowers) is the most rare figure and eventually was tracked down by my wonderful Mum and Dad as a wedding present. However, predictably, if pushed for a favourite, it would have to be the same as it was watching the series on TV at the tender age of 4, the legend that is Windy Miller.